Detailing the physical features, habits, territorial reach and other identifying qualities of the Common Gray Moth. 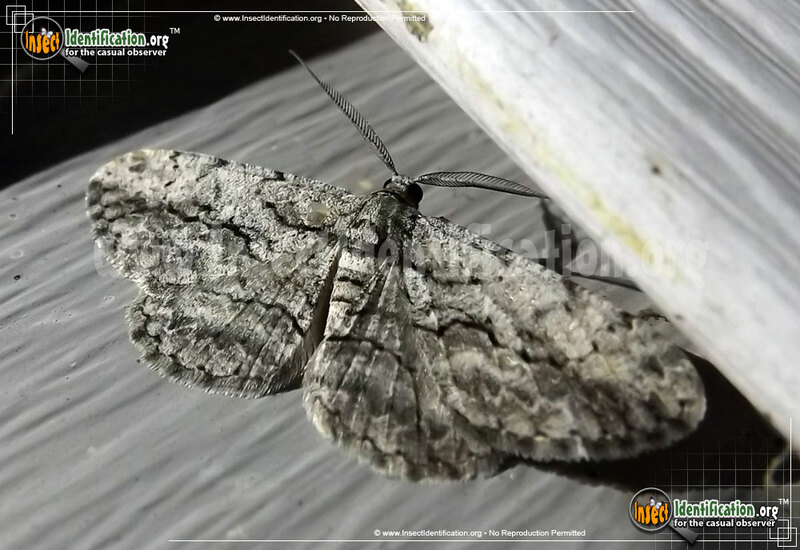 The gray color and mottled pattern on the wings of the Common Gray can offer this moth a degree of camouflage on light tree trunks, but its caterpillar is a master of disguise. Adults Common Grays can be found across the continent, though they do not venture into colder, arctic air. They are common in that they are ubiquitous, but also in that they look like many other moths in its family. Overall gray, the Common Gray has a fine pattern of black lines and white hues. Careful study of its thin black wavy lines and gradient shifts are needed to identify it. When the wings are flat, a long black line traverses both wings near the head. Shorter black lines are centered on each forewing as well as on each hindwing. Each antenna looks like a single black feather. Caterpillars of Common Grays eat leaves from a variety of trees like apple, crab apple, pear, ash, elm, willow, poplar, cottonwood, and aspen as well as smaller plants like clover. Like other Geometer larvae, they are light brown in color and resemble twigs, allowing them to feed and pupate while camouflaged. They stiffen their bodies and can detach one end from a branch in a way that makes them look like a new twig.